Coin frae auncient Thasos shawin Satyr an nymph, datit tae late fift century BC. 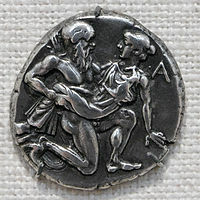 Archilochus wis involved in the Parian colonisation o Thasos aboot twa centuries afore the coin wis mintit. His poetry includes vivid accoonts o life as a warrior, seafarer an lover. But at least I got masel safely oot. Wha should I care for that shield? Let it gang. Some ither time Ah'll find anither na worse. Archilochus wis much imitatit even up tae Roman times an three ither distinguished poets later claimed tae hae thrown away thair shields—Alcaeus, Anacreon an Horace. ↑ While thir hae been the generally acceptit dates syne Felix Jacoby, "The Date of Archilochus," Classical Quarterly 35 (1941) 97–109, some scholars disagree; Robin Lane Fox, for instance, in Travelling Heroes: Greeks and Their Myths in the Epic Age of Homer (Lunnon: Allen Lane, 2008, ISBN 978-0-7139-9980-8), p. 388, dates him c. 740–680 BC. This page wis last eeditit on 7 November 2016, at 01:40.